Published: May 12, 2015 at 07:34 a.m. 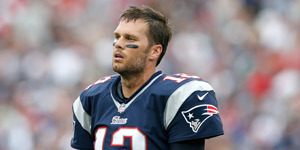 Updated: May 12, 2015 at 07:53 a.m.
How the outside world views Tom Brady following the quarterback's four-game suspension doesn't change how teammates within the New England Patriots' locker room will view him. The first Patriot to publicly voice support for Brady was veteran safety Devin McCourty, who happened to be at a YMCA charity event in Foxborough, Mass., when news of the quarterback's ban came down. "We've got full belief in Tom as our quarterback as a leader as a man on our team," McCourty said, via the Providence Journal's Mark Daniels. "I feel the same way as everyone else does in that locker room. Whatever it is, it'll be for our team, but we have full belief and faith in our quarterback in Tom and it's been like that for me for six years. And that's not going to change now." Other players displayed their disdain for the ruling via social media. McCourty added that Pats players plan to barrel forward with offseason work and not focus on the penalties. "I think right now we're just focused getting better for the offseason," McCourty said. "We're not worried about what's going to happen once the season starts. It's just too far away right now for us as a team. Right now, our heads are down and we're just trying to get better." Brady's appeal could shrink the penalty and lessen the weight that has shifted to backup signal-caller Jimmy Garoppolo.